In a letter to Rep. Bobby Scott of Virginia, the top Democrat on the House Committee on Education and the Workforce, DeVos wrote, "Let me be clear: I have no intention of taking any action concerning the purchase of firearms or firearms training for school staff under the ESEA, "a reference to federal Elementary and Secondary Education Act funds. The letter, posted to a Twitter account for the Education Department's press secretary, is dated Aug. 31. DeVos wrote that there is "substantial flexibility" in how school districts use These funds "and that" Congress did not authorize me or the Department to make those decisions. I have stated on many occasions since I was nominated for this position. 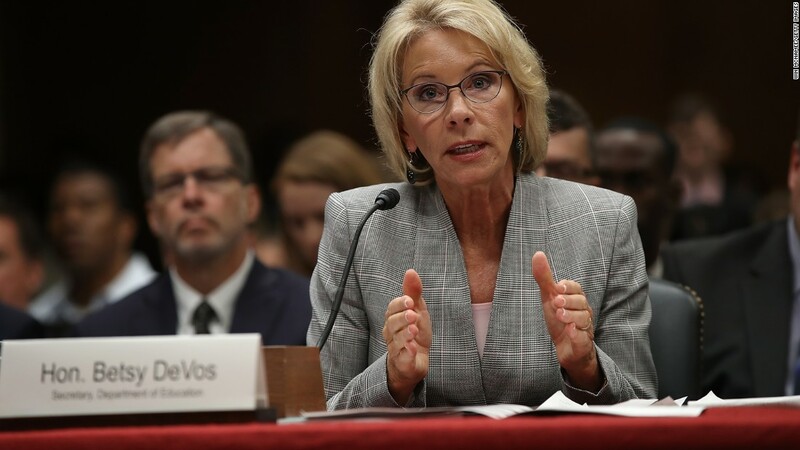 A senior administration official told CNN at the time that the idea was laid out in the Times report did not originate with the Department of Education or DeVos. The official also said DeVos thinks Congress should clarify whether it is permissible to buy guns.